Soaring thousands of feet in the air can excite anyone, but have you done it in a hang glider? This extreme sport is one which adrenaline junkies drool over and will leave you addicted once you try it. But don’t take my word for it; read about hang gliding and see what it’s all about! First off, what is hang gliding? Here’s another question you probably want to know: what is that big metal device which you hover on? Don’t worry, you’ll find the answers to these questions and more. To begin, hang gliding is arguably the simplest form of human based flight. 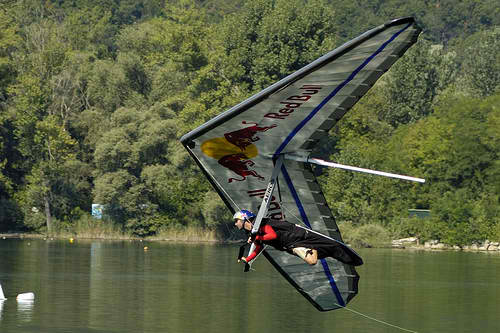 A hang glider is the rigid, metal frame which maintains the shape of a wing and allows you to maneuver through the air. If you are a true adrenaline junkie, you should already be getting goose bumps. 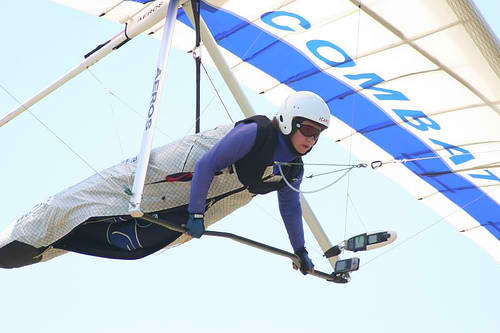 Most hang gliders are constructed from special nylon which covers an aluminum frame. These materials offer the greatest amount of support and are light enough to keep you in the air for long periods of time. They are controlled using the pilot’s weight and going one direction or the other relies heavily on which way you shift your body. Pilots are suspended from straps which allow them to hang perfectly between the glider’s frames; this is where the “hang” in “hang glider” came from. From that position, he or she can move forward to backward or side to side in order to change speed and direction. Most would agree that a ride on a hang glider feels like you have been transformed into a bird. You can easily stay in the air for up to 3 hours (sometimes longer) and reach elevations of up to 15,000 feet. Like any other extreme sport, hang gliding can be safe or it can be dangerous. It all depends on how many precautions you actually decide to take. You can definitely be in good hands if you seek advice from certified professionals and use equipment which is tested and safe. There are even professional schools which you can attend which allow you to practice in controlled environments under trained supervision. Another thing you must consider is Mother Nature. She can be unpredictable and being aware of the weather should be one of your top priorities. If you use good judgment and approach hang gliding with the right attitude, you shouldn’t have to worry about it too much. If you fail to do so then you can get injured or even killed. Almost anybody can learn to operate a hang glider. Picture it like this: if you can keep up a job with 50lbs on your shoulder, then you should have no trouble soaring through the air. Don’t think that hang gliders require tons of strength but turbulent conditions may require you to push through thick weather. 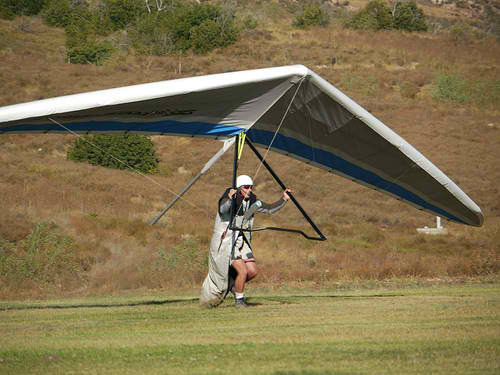 As you become more experienced, you’ll notice that your natural strength for flying the hang glider will increase. Balance and endurance play a much bigger role in piloting a hang glider than brute strength does. This is one reason why women make excellent pilots (they make up roughly 15% of the hang gliding population). Besides any physical conditioning that may be required for this extreme sport, being mentally prepared is equally important. You must be able to think clearly and rationally even during the most chaotic of situations. Before you even “think” about purchasing your own hang glider, you absolutely must know how to fly one. You can’t beat around the bush on this one. Unless you are trained and know what you are doing, you shouldn’t be attempting to fly one. Basically, try getting the go ahead from your instructor before attempting to get your own pair of wings. Also note different hang gliders carry with them many different characteristics each which call for a different skill level. Some are designed for agility and maneuverability while others are constructed for slow, smooth sailing. Again, your instructor can help you out on this one. He or she can assess your strengths, weaknesses, flying interests, and skill level to determine which glider will suit you best. Most dealers will require that you own some proof of certified training before they sell you a $5,000 piece of equipment. Yes, the price of gliders can be very expensive so always be sure you are buying from a reputable dealer before making any hasty decisions with that much money. The best and most formal way to become immersed in this extreme sport is to participate in a tandem introductory flight (when you fly with somebody else who is experienced). This doesn’t increase your skill level at all; it only gives you the taste of flying. Once you decide whether or not it’s something you would like to pursue then you can sign-up for the actual introductory course. You’ll be under radio supervision as you fly through training hills and slowly progress towards higher and higher flights. This all takes place in two, long days. Basic techniques such as launching, turning, and landing are all fairly simple to learn and are taught as well. Depending on how fast you grasp the concepts and how the weather is like; you can either be complete with the course in a shorter or longer amount of time. Once you complete the introductory course, you’ll then move up into the novice classes which aim at teaching you more advanced concepts. For example, different flying and launch techniques, tons of safety procedures, and other important techniques are demonstrated during this phase of training. Most pros would agree that you should take your time in this course and really concentrate your effort on doing well; not finishing fast. After all, you’ll most likely be flying by yourself very routinely from here on out so It’s imperative that you are fully prepared. You can never be too safe. Caution and safety measures outweigh technique any day of the week. This entry was posted in Air Sports, Hang Gliding and tagged Hang Gliding. Bookmark the permalink.